"These are still early days in the 22 year old's career...it would be no surprise to see Wattel take inspiration from his compatriot's recent breakthrough into the winners' circle." Look back through the rollcall of winners during the second half of 2013 and you will find a series of much-heralded youngsters landing their first title - Jordan Spieth, Tommy Fleetwood, Jin Jeong, Victor Dubuisson, Morten Orum Madsen, and Patrick Reed. With the exception of Jeong every one of them was plausible, regularly tipped by either myself or other betting.betfair contributors (Steve Rawlings was backing Reed almost every week before cruelly missing out). Every one of them started the week as a big-priced outsider, meaning a level stakes bet every week would have returned enough to cover the whole season and plenty more. One of my punting plans for 2014 is to do precisely that - place one unit on each of the following quartet in every event they play. Using the reliable barometer of the greens in regulation stats, Grillo has tremendous potential as only Race to Dubai champion Henrik Stenson hit more in the last six months of 2013 on the European Tour. 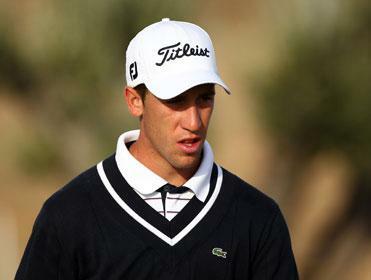 The 23-year-old Argentinian's international career is still in its infancy but it wouldn't shock me were he to eventually follow in the footsteps of compatriot Angel Cabrera and win a major. So far he's been regularly on the fringes of contention without ever seriously challenging, with a clumsy, short game costing him dear. That classic failing among novices is liable to improve soon and when it does, those solid top-20s will become regular contention. At the same age of 23, Kieffer cuts a similar profile to Grillo. He also hails from a country that produces golf champions and is probably the best emerging German player. Kieffer's maiden Euro Tour campaign included one near-miss at the Spanish Open and a series of promising efforts on the fringes of contention. He finished the season strongly, registering top-30s in five of his last six events, and was always available at massive odds, often in excess of [200.0]. He'll win eventually for sure and if it occurs at those odds, it would be enough to cover five years of level stakes bets. In a sense, the case of Wattel illustrates the uncertainty of backing young prospects. The Frenchman would have been an obvious pick for this column ahead of either of the last two seasons yet, despite a series of placed efforts, he remains winless. No matter. These are still early days in the 22-year-old's career and, in terms of prize money, he's achieved plenty already. Wattel strikes me as being ideally suited to low-scoring contests, where his power off the tee and putting excellence are best rewarded. Rather like Dubuisson, he looks made for desert golf and it would be no surprise to see Wattel take inspiration from his compatriot's recent breakthrough into the winners' circle. Castro has made steady progress during his two seasons on the PGA Tour and, after coming into his own during the last six months, looks well primed for a breakthrough. He was relentlessly consistent from tee to green during the late summer spell, earning some lucrative FedEx Cup paydays and finishing a respectable 12th in the USPGA, on only only his second major appearance. Castro's best chances for victory will be on courses that particularly reward driving accuracy.